Grid Component for Embarcadero RAD Studio, Delphi and C++, VCL and Firemonkey frameworks and Lazarus FreePascal. 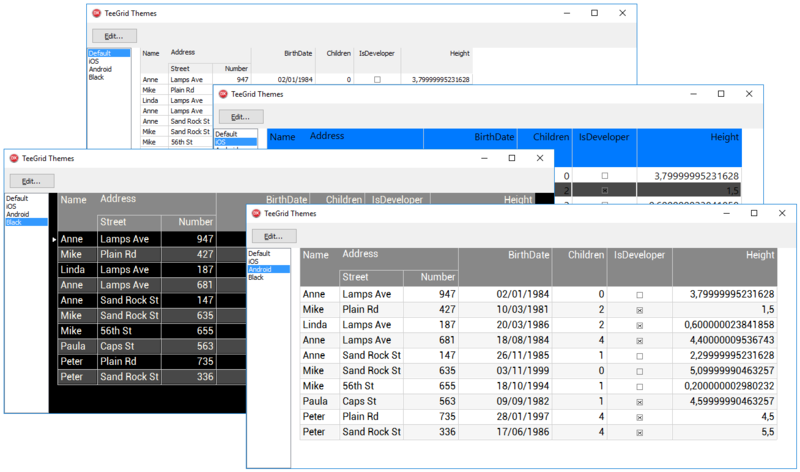 TeeGrid is a lightweight full-featured Grid / Tabular control written from scratch (not derived from TCustomGrid or TGrid). TeeGrid Grid component for Embarcadero RAD Studio, Delphi and C++, VCL and Firemonkey frameworks and Lazarus FreePascal.TeeGrid is a lightweight full-featured Grid / Tabular control written from scratch (not derived from TCustomGrid or TGrid), aprox 10K lines of code and 100K compiled size.Fully compatible with VCL and FMX offering you the means to take common core code for gridding on Windows, Android and iOS/OSX.TeeGrid Grid component is offered free of charge for non-commercial use (in binary format). Commercial license includes 100% sourcecode and comes with a renewable one-year subscription service that entitles customers to free updates and technical support. Delphi components that create 1D and 2D barcodes. It supports: ean, pdf 417, datamatrix, aztec, macro pdf 417, maxicode, upc, code128, etc. ICE License is a new software licensing protection solution designed to provide a high level of security.With ICE License you can turn your software in "Trial before to buy " with little effort.ffering everything to guarantee a maximum protection. PrintDialogEx contains an extended Print Dialog component for Delphi.TPrintDialogEx displays a PrintDialog with an additional ComboBox to select:- All Pages- Odd Pages- Even Pages.PrintDialogEx includes all source code!